Trading Places opens on the streets of Philadelphia (sans Bruce Springsteen) as the city wakes up and people start going to work. Interspersed with these scenes of working people, we are shown the extremely wealthy and the extremely poor, which given that this is going to be a film about wealth and privilege is a pretty subtle opening to the film. The fact that we see carol singers and Christmas decorations featured throughout this opening montage, gives us a pretty fair indication of time and place. The only distraction in this sequence is that the music used sounds remarkably similar to a featured piece from that other John Landis directed and Elmer Bernstein scored film Animal House, so I’m left wondering if it’s because all of his scores sound the same or he’s lazy or it’s supposed to be a witty musical call-back and by the time I decide that it’s probably a combination of the last two I’m halfway through the next scene and have to rewind it a bit. The wealthy person we see being fed, pampered, shaved and dressed by his butler in the opening is Louis Winthorp III (Dan Aykroyd). We are then shown the Duke brothers (who are played with the perfect amount of arrogance by veteran actors Don Ameche and Ralph Bellamy) who live in even more luxury than Louis. As they are chauffeured to “The Club”, they are discussing heredity versus environment, while watching Louis’ hunch on Pork Bellies futures paying dividends. The argument on heredity versus environment continues with Winthorp being used as alternately as an example of both “good breeding” and a “good environment”. As the Dukes arrive at “The Club” they see Billy Bay (Eddie Murphy) who is begging, pretending to be a blind veteran with no legs and the Duke’s discussion between heredity versus environment is expanded to include Billy Ray as an example. As Louis arrives to get the company’s payroll cheques signed by the Dukes’ who treat him like another one of their servants, only paying attention when Louis questions the cheque for an employee “Clarence Beaks” who he can’t find a record of. The Dukes assure Louis that Beaks is working on a special project and say they’ll hand the cheque to him personally. They then continue arguing whether Louis’ success is due to him being the “product of good environment” or whether “it’s in the blood”. On the way out of “The Club” Billy Ray bumps into Louis, after picking up Louis’ bag to try and hand it back, Louis accuses him of trying to rob him and in the confusion picks up his bag and runs through the club, before being arrested by police. Watching this, the Dukes set up a wager on whether Billy Ray can take over Louis’s job and run the company as well and whether if they destroy Louis’s life by making him “lose his job, his house and his fiancée” he will turn to crime. We meet the mysterious “Clarence Beeks” (who played the Deputy Police Chief in the similarly festive Die Hard which I watched a few days ago) as he frames Louis first by framing him for theft by placing marked bills on him to disgrace him at “The Club”, then by planting PCP on him for when the police arrest him so that he will lose his job and then by paying a prostitute named Ophelia of all things (Jamie Lee Curtis) to embrace him in front of his fiancée to leave him entirely alone. At the same time Billy Ray is bailed out by the Dukes and set up in Louis’ house, with Louis’ butler and Louis’ job. After an awkward transition including a party featuring a lot of uncomfortably gratuitous shots of breasts, Billy Ray soon finds himself comfortable with his new surrounds. After being bailed out Louis borrows money from Ophelia for a taxi to go to his house where the locks have been changed and he is shunned by the butler and to the bank where he is told that his accounts have been frozen. She takes pity on him and lets him stay at her apartment. After Billy Ray is proven successful and Louis turns to crime, the bet is decided and environment wins out. While smoking a joint in a bathroom stall, Billy Ray overhears the Dukes discussion that now that the bet is concluded they can sack Billy Ray and leave Louis destitute. Billy Ray and Louis then team up in order to destroy the Dukes. After working out that Clarence Beeks is stealing a report which will determine the outcomes of Frozen Concentrated Orange Juice futures trading (yes, really), they hatch a scheme which will enable them to destroy all of the bad people, make themselves fabulously wealthy and put Jamie Lee Curtis in lederhosen and Dan Aykroyd in blackface. Louis and Billy Ray are then on the trading floor on Wall Street where we are treated to a laboured explanation of commodities trading. Halfway through this lecture on the minutiae of the price of FCOJ I had to stop the film to look up the screenwriting credits to see if this was written by a frustrated broker. By putting in the absolute least amount of actual effort that I could, I discovered that Trading Places was written by Timothy Harris and Herschel Weingrod who appear to be a screenwriting partnership responsible for such exceptionally well researched films as Space Jam and Kindergarten Cop. So I guess that the considerable detail on the ins and outs of futures trading is either the result of comprehensive research or just a bunch of spurious nonsense. So, anyway, on the FCOJ trading floor we see lots of frenzied shouting of numbers and prices going up and down. There is a brief pause as the crop report is read out love on what is possibly the world’s dullest television station and the shouting returns anew. The Dukes now look incredibly stressed and Louis and Billy Ray are grinning widely. We are led to believe that the result of all of that shouting and waving about of bits of paper that the Dukes have managed to bankrupt themselves. Which seems somewhat of a stretch given the size of their company and my understanding of what this film spent a long time trying to teach me about the nature of FCOJ trading. The fact that our heroes bankrupted not only the Dukes, but would have destroyed their company and the lives of their employees (somewhere in the vicinity of Christmas) through the provision of false documents, as well as using stolen documents for insider trading is somewhat lost amongst the happy ending. 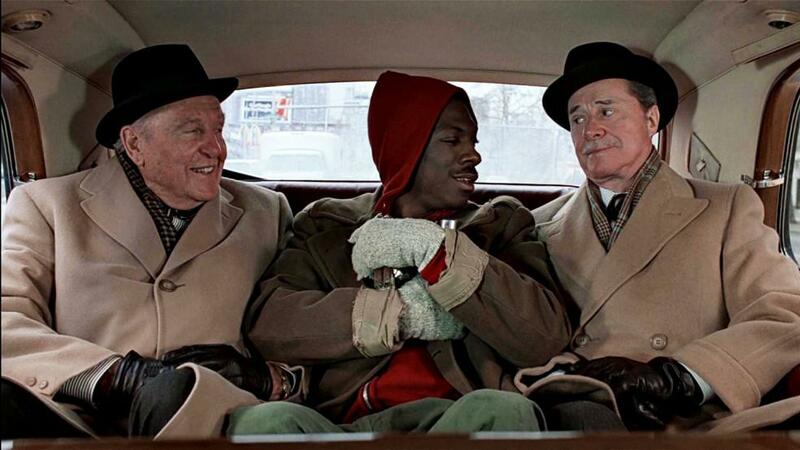 Trading Places was an enormously successful film. The fourth highest grossing film of 1983, it made a star out of Eddie Murphy, resurrected Dan Aykroyd’s career and took Jamie Lee Curtis out of genre films and into the mainstream. It also provided wonderful late career roles for Don Ameche and Ralph Bellamy. Watching it today there’s a lot to like, but as with any film which features blackface and a man being raped by a gorilla, there’s also a lot that is pretty embarrassing to watch. Much like A Christmas Tale, the film is set on or around December 25, but Christmas is pretty much incidental to the story. 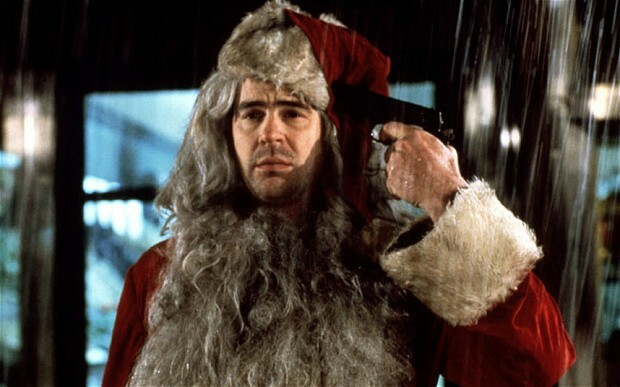 If I were cynical, and I am, I would believe that the whole timing of the movie was an easy way to guarantee additional annual income as one of those Christmas films that is shows up on TV every December. Either that, or the writers came up with the image of a drunk and dishevelled Santa in the rain with a gun to his head and tried to work out how to fit it into their fast paced story about commodities trading. Oh. Is the title Trading Places supposed to be a pun? God I hope not. Anyway, given that the film ends with a man being raped by a gorilla, followed by a group of insider traders living large on an island paradise using the spoils of their entirely criminal activities, the spirit of Christmas feels a little weak. I give it four out of nine reindeer.